Don’t miss this deal for a HP Envy 5531 Wireless Web e-All-in-One Touch-screen Inkjet Printer for just $69 + FREE Shipping! This is a HUGE saving and the cheapest I have found anywhere! Most places has the HP Envy 5531 Wireless Printer priced for over $100 or more! 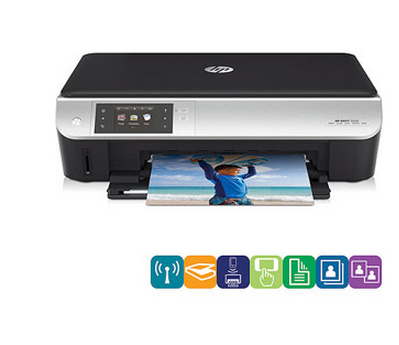 This HP Envy 5531 Wireless Printer originally was priced at $169 + that is a saving of $100 +! Don’t hesitate to grab this printer today as with all deals supply is limited! Find more Amazon Deals, Holiday Deals and Walmart Deals on Frugal Coupon Living! I haven’t promoted Jasmere in a while; but I love their site. They are another daily deal site; but with their deals, the more who buy, the lower the price goes. It usually starts around 50% off and goes lower and lower. Their sales change each day at noon. Today, head over to get a box of 12 6 oz. bags of gourmet flavored popcorn for as much as $1.33 each from Colby’s Kettle Corn and most likely less by the time the sale ends tomorrow. You can choose from Cinnamon Sugar Sensation, Chili Cheese Obsession, Salty Sweet Addiction and White Cheddar Passion OR get a combination pack of all four. Yum! Head over to Jasmere for a look. Head to Jasmere this weekend and grab this all-natural 6-piece cleaning kit from Better Life for over half off. You assemble the set based on your household needs. It is valued at $48 and you’ll pay $21 or less plus $8.95 shipping. I have personally used these products for a little while and definitely give them a thumbs up. In fact, I think the glass cleaner is better than many cleaners on the market. Kiddo Tags – at least 56% off! Head to Jasmere to find the Kiddo Tags in their daily deal for just $15 right now ($34 value). They have permanent stickers, temporary labels and iron-ons and they are so cute. You can even get them to go on your baby’s paci! Today’s deal lets you get stackable codes which will be combined for one order. With Jasmere, the price goes down the more people buy. You will only be charged the final amount. Sale ends tomorrow, March 10th, at noon! Find more Today Only Deals at Frugal Coupon Living. *HOT* Florida Citrus – 20 lbs. for less than $20! Jasmere’s deal of the day (for the weekend) is Florida citrus from The Orange Shop, around since 1936, for $18.69 at the most! We LOVE our citrus here in Florida and I’m sure you will too! Right now, it is at $21; but use code save11 to save and additional 11%. But remember, the more people who buy, the lower the price goes! What will you do with 20 pounds of Navel Oranges or Ruby Red Grapefruit or both? Well, if your family doesn’t go through it as quickly as mine, you can always juice it and have fresh orange or grapefruit juice – or both. You can make Orange Marmalade – yum! You could split it with someone else. Or you could gift this to someone for the holidays! This is a great deal! You can get more than 20 pounds too if you need more. Shipping adds $12.95 per box (which still gets you out the door for less than the retail value of $45). You may order up to 5 orders. Head over to Jasmere to put in your order! I’ve shown a lot of reusable bags on FCL and that’s because they’re not only responsible and very versatile but they’re always a good deal! This weekend’s deal on Jasmere is no exception. These colorful bags from Flip & Tumble fold up into little balls that fit in your purse so you never forget them. And your $29 voucher will go a long way toward getting plenty of bags for you or as gifts. Right now, it’s only $13 and could go down even further by noon Monday, 1/17. Head to Jasmere to get your vouchers! Jasmere’s deal for the rest of the weekend is an opportunity to give to the Leukemia and Lymphoma Society. For every $10 you give, Jasmere will match it with another $10 and give it all to the Leukemia & Lymphoma Society. I know many of us know someone affected by these disease, so if you are able to give, this is a great opportunity. Donations are tax-deductible. Since this deal ends on Monday and you will not actually be charged until then, I don’t think this donation can be filed with your 2010 taxes (just FYI). New to Jasmere? Head HERE to sign up! I shared this one with you last time Jasmere had them (and I’ve done a giveaway for Strawsome) and let me just say that I love them! These durable glass straws could replace that bag of bendie straws in your drawer right now! They are one of a kind handmade and very practical. We love them at our house and I’ve given them as gifts too. The price is currently $22 for a $50 voucher. OR, you can get the bonus feature: a $50 Gift Certificate that you can give to someone and they can order exactly what they want. The gift certificate includes shipping while the normal voucher does not. That price is also $22 currently. Head to Jasmere to put in your order this weekend. If you place your order with Strawsome by December 17th, you will still have the straws in time for Christmas.